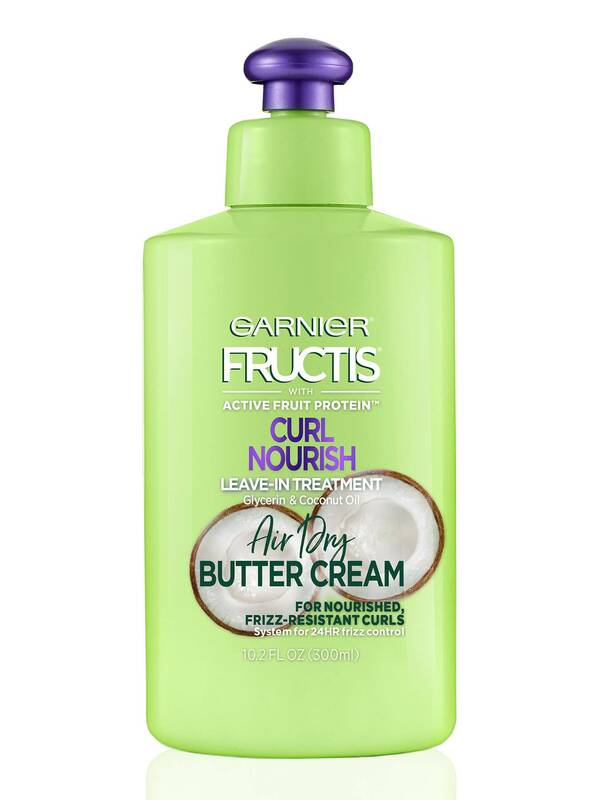 Rich, quenching Fructis Curl Nourish air dry butter cream leave-in cream, with Coconut oil, replenishes for long lasting moisture and 24 hour frizz control. Hair is stronger, curls more defined, shinier & softer. 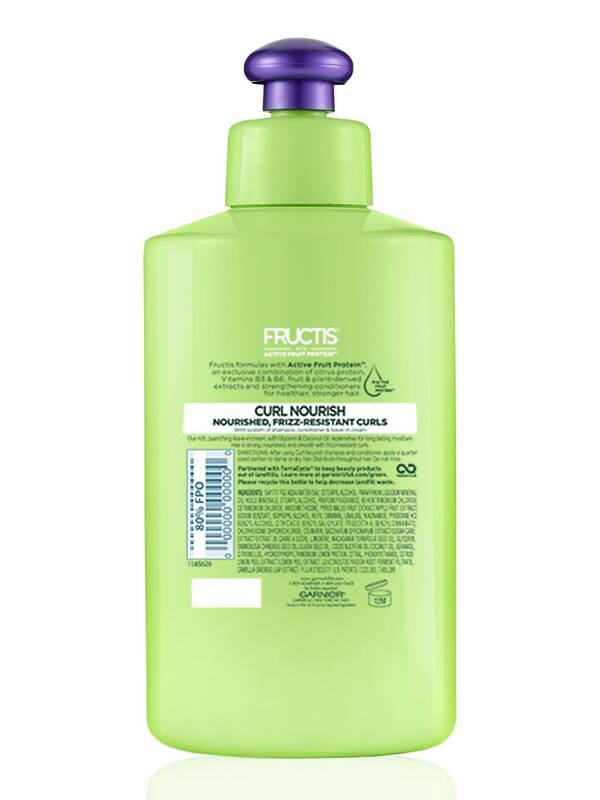 After using Curl Nourish shampoo and conditioner, apply a quarter-sized portion to damp or dry hair. Distribute throughout hair. Do not rinse. Rated 4 out of 5 by Andrew P from Decent Product, Wish They Would Add Hold After finally running out of sources for Curl Calm Down, I had to find something that nourishes my curls and holds them. I have had to use another product for hold, that works but not as effective a C.C.D. I prefer the smell of the new Buttercream product. If they could only add an element of hold, we would be all set. Rated 1 out of 5 by Lovemycurls2 from Bring back the original!!! I have used the original for years! This new formula is horrible and makes my hair dry an frizzy like a brillo pad! BRING BACK THE ORIGINAL!!!!!!!! Rated 5 out of 5 by crimsona1 from This helped my curls a lot. my hair was extremely less frizzy, my curls were still intact and it gave my hair volume. I love it! Rated 5 out of 5 by aleluyaamaya from Love to use this product during the summer. When i am all the time in the pool or the beach. It would help me to have my hir hydrated and protected from the chemicals from the pool and the salt from the sea. And also it help me to have nice wavy hair. Rated 5 out of 5 by lorenac91f7 from This product really helps make my hair feel smooth and it has such a great scent. I feel like this is one of the best creams I have used. High effective. And recommended to anyone with curls or wavy hair. Rated 4 out of 5 by claud_barnard from I bleach my hair so this product is a life saver for texture. Keeps my hair managable and soft with natural curls intact. Im not a super big fan of the scent. Great product for the price compared to other curl options. Rated 4 out of 5 by rebeccah10 from Pretty good! I like leaving this in and going for runs or workouts. When I come back and rinse my hair its usually really soft. The only reason I knocked it down one is that I feel like after awhile it causes unecessary buildup in my hair.